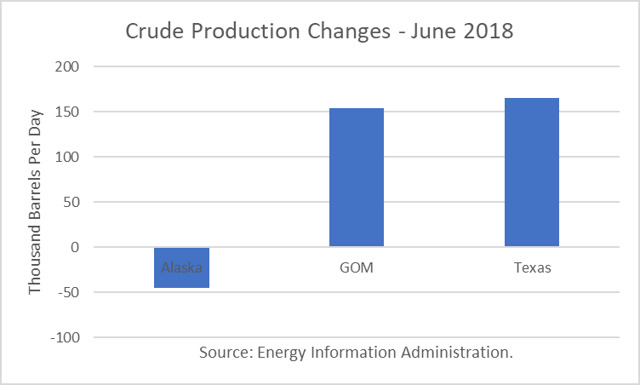 The Energy Information Administration reported that June crude oil production averaged 10.674 million barrels per day (mmbd), up 231,000 b/d from May. The surge was partly on the back of a rebound of 154,000 b/d in the Gulf of Mexico (GOM) which had fallen due to unplanned maintenance. In addition, there was a surge of 165,000 b/d in Texas and a loss of 45,000 b/d in Alaska due to normal summer maintenance. 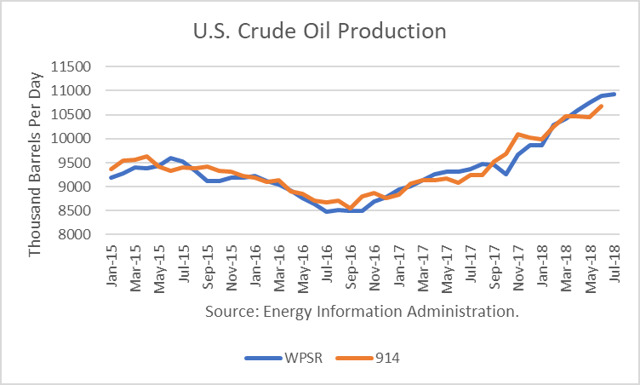 The EIA-914 Petroleum Supply Monthly (PSM) figure was 223,000 b/d lower than the weekly data reported by EIA in the Weekly Petroleum Supply Report (WPSR), averaged over the month, of 10.897 mmbd. EIA has since kept weekly production estimates essentially flat, as it apparently waits for the monthly survey numbers to catch-up. The June figure was a year-over-year gain of 1.585 mmbd. And the EIA Drilling Production Report estimates a 93,000 b/d gain for September. 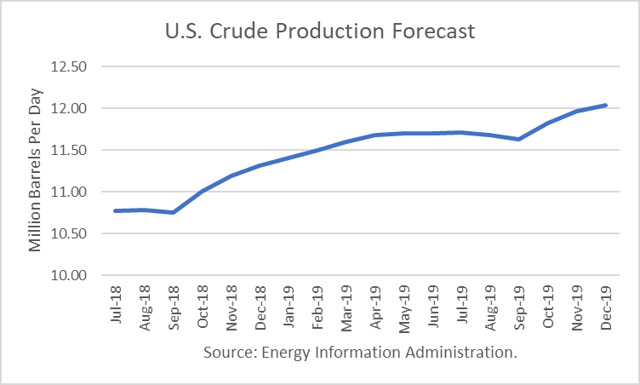 Looking further ahead, the EIA is projecting December 2018 output to rise to 11.310 mmbd, up 1.29 mmbd from December 2017. Also, EIA projects that other supply (liquids) will rise to 6.88 mmbd, up 590,000 b/d from last December, for a total gain of 1.87 mmbd. The biggest concern about realizing these forecasts is infrastructure constraints in the Permian Basin. I have examined that issue in greater detail in recent reports. I have found that relief is on the way later this year and into 2019. There may be an oversupply of pipe capacity by 2020. The annual rise in U.S. production of crude and liquids of about 1.87 mmbd is larger than the predicted growth in world demand. The real question is whether the OPEC+ production increases can make-up for further potential losses in Venezuela and Iran, as well as Libya and Angola. The market will remain uncertain going into November and probably December. SUBSIDISED RATE; AND WORLD BANK SHOULD BEAR THE SUBSIDY COST; IS IT POSSIBLE ?